Since WordPress morphed out of b2/cafelog in 2003, itâ€™s overtaken all competitors to become the worldâ€™s content management system of choice. Over 100,000 new WordPress sites are created every day! 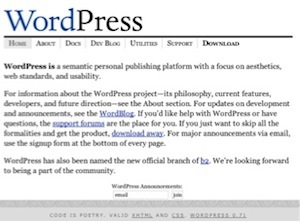 At the center of WordPressâ€™s success has been its ease of use, clean styling, and open-source ethos, as outlined in a VERY early version of WordPress.org. The beauty of WordPress is that it works for corporations (driving the likes of Wired, CNN, and The New York Times), as well as for smaller blogs and businesses. Harness its powerful APIs, plugins, and other extensions? 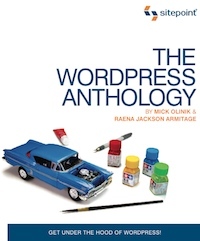 The WordPress Anthology by Mick Olinik and Raena Jackson Armitage is the new book from SitePoint. Its 336 pages offers web developers a broad base of WordPress solutions, putting you in control of this impressive CMS. Jam-packed with proven tips and techniques, youâ€™ll discover how to effectively use WordPress to better meet your, and your clients’ needs. In short itâ€™ll … make the worldâ€™s most versatile CMS work for you! Mick is a digital sales architect with over 13 years experience on the web. He helps businesses, clients and start-ups - plan, action and measure their digital sales success. Including getting hands-on with Google AdWords, conversion rate optimization, retargeting and email marketing.